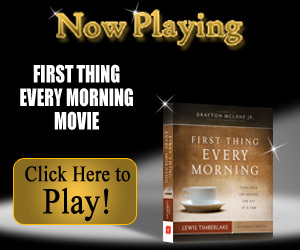 First Thing Every Morning ~ Turn your life around one day at a time and start today by pausing to enjoy the movie First Thing Every Morning. Set the tone for the day and lift your spirit by starting each day with a reflection, story or quote found in the book First Thing Every Morning. What do you do the first thing in the morning? Do you take time to pray, to meditate, to honor God? The best thing to realize is that life goes much smoother when we take time to recognize God's purpose for the day and begin to accentuate the positive. When we don't it's so easy to let external situations and circumstances get us depressed. The first thing in the morning is the most vital part of the day. Have you ever been energized by a song the first thing in the morning and that song was in your head the whole day? That's because you heard it first thing in the morning. What we hear, read, and meditate on is powerful. They all directly affect our attitude and in life attitude is everything. How you look at your life is determined by the thoughts you start your day off with. This is very much needed in my life.